From GoF: Represent an operation to be performed on the elements of an object structure. Visitor lets you define the new operation without changing the classes of the elements on which it operates. The classes in the composite to be Visited must be set up to receive a Visitor. Once that is done, any number of Visitor types can be created without changing the classes to be visited. In trhe diagram, the abstract Element class has an AcceptVisitor method which takes an abstract Visitor instance. ConcreteA and ConcteteB, the actual implemented classes in the structure, inherit this. They know to call VisitConcreteA or VisitConcreteB on the Visitor passing themselves to the call. The concrete visitor then does what it's supposed to do with that class and returns. 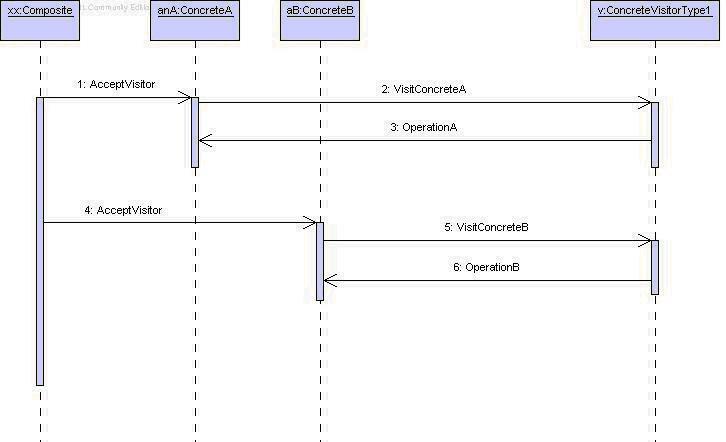 The composite then calls AcceptVisitor on the next member of the composite as shown in the sequence diagram below. The class diagram assumes that the object structure to be visited is a Composite. This does not have to be the case. Any object structure which can navigate through itself is a candidate for accepting a Visitor. 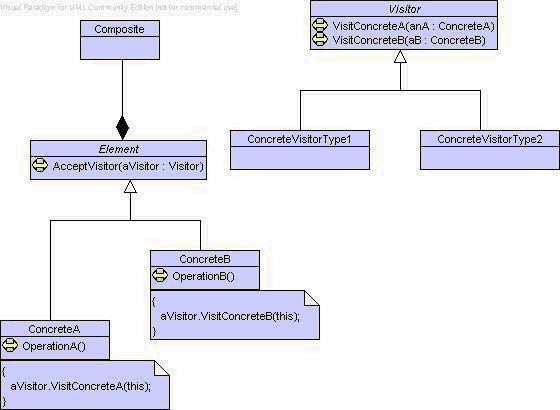 Thus by implementing different types of Concrete Visitor different operations can be performed on the object structure. One example of this is if a compound object (say an Order, containing Lines which in turn can contain lower-level breakdowns) is to be serialised in several ways: to XML, to a flat-file containing variable-length rows with fixed-length fields, etc. A different type of visitor can be created for each type of serialisation, each of which knows how to serialise the classes in the Order to the intended format. Question: Was it a good idea to call the abstract visitor SerialisingVisitor? If I want to create a Visitor to do something else entirely (say apply discounts) to an Order I now have to create matching overloaded methods which take a DiscountVisitor. Would it not have been better to call the visitor OrderVisitor and derive SerialisingVisitors and DiscountVisitors from that? With overloaded methods you can explicitly see which type of operation the visitor is carrying out (in a debugger: static inspection won't tell you); on the other hand you have a lot of duplicated code. With an OrderVisitor there is no duplicated code, but a decent debugger will show you the type of the visitor. Majority decision to the OrderVisitor, IMHO. Note that the amount of code is slightly greater (class declarations etc) when using the Visitor pattern versus putting the 'action' code in the classes to be acted on. However the code is much better organised: the Order classes do not contain anything to do with serialisation which is good as that is not their primary responsibility; knowledge of how to serialise an order in a given way is encapsulated in the appropriate Visitor implementation and not spread out through the classes involved in the order. Adding another serialisation method merely involves creating a new Visitor implementation, not changing all the classes involved in the Order. This results in much cleaner, more maintainable, code. Visitor's primary purpose is to abstract functionality that can be applied to an aggregate hierarchy of "element" objects. The approach encourages designing lightweight Element classes - because processing functionality is removed from their list of responsibilities. New functionality can easily be added to the original inheritance hierarchy by creating a new Visitor subclass. Airfix models can be viewed as an object structure. Navigable models can accept a Visitor such as G14Paint. If G14 turns out to be inappropriate, then a G17Paint visitor can easily be developed and substituted without changing the model. Visitor implements "double dispatch". OO messages routinely manifest "single dispatch" - the operation that is executed depends on: the name of the request, and the type of the receiver. In "double dispatch", the operation executed depends on: the name of the request, and the type of TWO receivers (the type of the Visitor and the type of the element it visits). An acknowledged objection to the Visitor pattern is that it represents a regression to functional decomposition - separate the algorithms from the data structures. While this is a legitimate interpretation, perhaps a better perspective/rationale is the goal of promoting non-traditional behaviour to full object status. The Visitor pattern is like a more powerful Command pattern because the visitor may initiate whatever is appropriate for the kind of object it encounters.